Earlier this month, I criticized former Health Minister and interim NDP leader Maureen MacDonald for her deliberate snub of incoming leader Gary Burrill as she made her abrupt departure from the legislature. This drew an indignant response from a longtime backer of the party’s demoralized Dexter faction. Nevertheless, NDP insiders know the snub was real, deliberate, and gratuitous. For his part, Burrill hasn’t exactly embraced the Dexter supporters he so soundly defeated. No one wanted to take over the reins of the party after [outgoing leader] Elizabeth Weir announced she would be stepping down as leader, while keeping her lone NDP seat in the legislature. There were a lot of good reasons for me not to run—reasons I outlined for Elizabeth during an early morning meeting I was summoned to so she could discuss with me the issue of leadership. When I argued I didn’t have the kind of political experience needed to take it on, she assured me she would be at my side as my personal mentor. I jumped in and the party found two people to volunteer to run against me so it would look like a real race. I was elated the night I won, and dumbfounded three weeks later when Elizabeth announced she was resigning her seat immediately to take a government appointment. Like Gary, I had almost no notice and little time to prepare for a significant gap in leadership. Even before Elizabeth settled into her new position, she abandoned her mentorship role and never returned my calls. I was never able to secure a seat and managed to lead my party to historic lows. My lack of experience, inability to speak French in an officially bilingual province, and my public role in the abortion and LGBT rights movements, all played out the way I had predicted during that early morning conversation with Elizabeth. Following Weir’s departure, the NDP has never won a provincial seat in New Brunswick. Brewer thinks her biggest mistake was not to run in the byelection to fill Weir’s Saint John Harbour seat, which Weir had won four times. She urges Burrill to seek MacDonald’s vacated Halifax Needham seat when Premier Stephen McNeil calls a byelection. There are likely a lot of NDP leaning voters in Halifax Needham ready to right the wrong from the last federal election when they turned their backs on Megan Leslie in an attempt to oust Harper. The riding woke up that post-election morning realizing it had made a colossal mistake in voting strategically and losing arguably one of the best politicians in the country. Meanwhile, back in the caucus office, Gary has a lot of work to do. Whether Maureen will be able to bury the hatchet remains to be seen. It’s not looking good on that front so far with her abrupt and rather classless departure. And make no mistake. If she were giving up the seat to make way for the new leader, she would have given him more than a day’s notice. That’s the way it’s done. Let’s hope that here in Nova Scotia, the caucus and party members who didn’t support Gary for the leadership are able to put that behind them and make way for the new guy. He may lack experience but seems to have a whole lot of class. Running in Halifax would be a risky move for Burrill. While it should be hospitable territory for the NDP, it is clear Burrill can’t count on help from MacDonald. Running and losing in Needham would be an inauspicious start to his leadership, less than a year before an expected general election. Consider the fate of former NDP leader Helen MacDonald, forced out after she lost a Cape Breton North byelection to then political novice Cecil Clarke. Avoiding such internecine wrangling is why it is the winner’s job to reach out to the losers after battle. Burrill hasn’t done that so far, and he may pay the price as the Dexter debacle continues to take its toll. 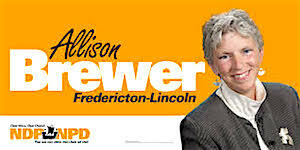 UPDATE & CORRECTION: The original version of this post misstated Allison Brewer’s city of residence and the year she spent as leader of the New Brunswick NDP. Apologies for the errors.